Click Store Design and click Pages tab. Click Edit button for the desired page. Position your cursor in the Page content window where you want photo to display and click the toolbar's Picture icon. Use the Insert Image window to Browse to a file or enter an address in the Image URL field. Note: Images must be .jpg, .jpeg, .gif or .png files. Uploaded images cannot be more than 10MB each. While images up to 5000 x 5000 pixels can be uploaded, they will not be displayed larger than 1920 x 1080 pixels. Click Insert Image. The window closes and the photo displays in editing window. Resize the image by clicking and dragging any corner of photo. Or click one of toolbar's three size-by-percentage buttons. By default, the photo is inserted with no float applied. 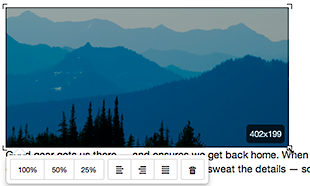 You can change how text flows around an image by clicking one of the toolbar's three float buttons. Experiment to find which one suits your needs. Click Save. Your edits are applied, the page returns to the Pages tab list of storefront pages. Note: To resize or reposition a photo after it's been saved, reopen the storefront page and click on the photo within Page content window. how to add a forums to page ?